Our 2019 Legislative Policy Guide is intended to arm readers with facts and key questions to consider so each reader can be better informed on the issues that are being dealt with in the 2019 Kansas legislative session. Kansas Policy Insitute promotes research and possible solutions that better secure the freedom and prosperity of Kansans. From this, the Kansas Policy Institute publishes the 2019 Legislative Policy Guide. There are five critical issues to solve if we are to support the economic and educational future of Kansas. 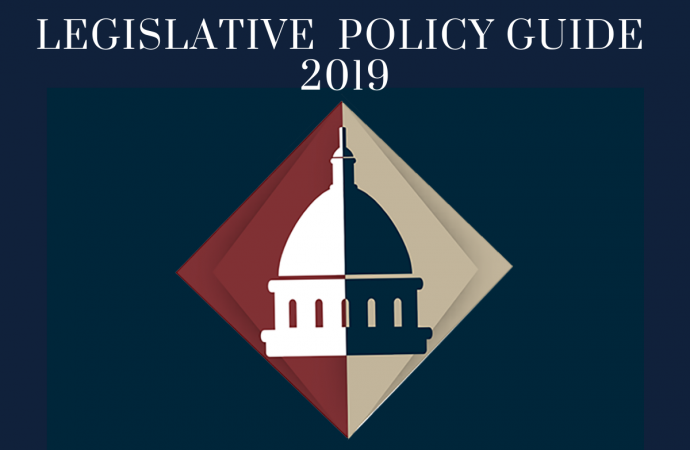 See the 2019 Legislative Policy Guide. The Kansas Legislative Research Department last December showed more than a $1 billion revenue shortfall over the next four years. Meanwhile, Kansas is in its fourth consecutive decade of economic stagnation. Increasing taxes to address the shortfall would only make a weak economy worse. Some claim spending can be increased for Medicaid and other new proposals without tax increases, instead choosing budget maneuvers. The purpose of these ‘gimmicks’ is not to restore government, but to further increase record-setting spending. Contrary to claims by education officials, simply spending more money has not produced better achievement in Kansas or anywhere else. Reading proficiency on the National Assessment of Educational Progress (NAEP) increased 2 percentage points over the last two decades. However, over the same time spending grew 35 percentage points above inflation-adjusted levels. Holding school spending accountable could better ensure that more money is spent in classrooms; improving student outcomes. Kansas is one of 14 states that has not expanded Medicaid coverage to able-bodied working-age adults. Kentucky and Ohio saw costs exceed estimates by at least $3 billion with many other states having similar experiences. The state of Louisiana, a model noted by Governor Laura Kelly, underestimated expansion enrollment by 100,000 people. Medicaid expansion crowds out spending on other priorities (i.e., education, transportation) or leads to a bigger tax increase. Changing the rules on association and short-term health plans can make health care more affordable and accessible to Kansans. Kansas is a right-to-work state; public employees can opt out of paying dues or joining a union. However, unions have a monopoly on worker representation. Those who aren’t members are forced to comply with the terms imposed through union representation. The Kansas Supreme Court’s latest ruling that an $854-million funding increase is inadequate renews talk of amending the constitution. Separation of powers is fundamental to our constitutional republic. Kansas’s constitution vests authority to spend solely with the Legislature. Proposing a constitutional amendment honors the system of checks and balances and upholds the rule of law. Making sure government is held efficient and accountable allows more Kansans to live their lives as they choose. The Legislative Policy Guide 2019 provides long-term answers to protect those freedoms.